Watch a free Turkish lesson! Turkish for kids Premium Set includes 6 DVDs, 150 Flashcards, 10 posters, Vocabulary book, 10 Storybooks, Storybook DVD, Storybook Audio CD, Culture book, Alphabet book, Alphabet poster, Songs CD, Activity book, Coloring book, Animals picture dictionary, Flag poster, World map, Progress chart & report, Dinosaur plush toy, 2 finger puppets and a pack of 8 crayons. What is inside the Turkish Premium set? 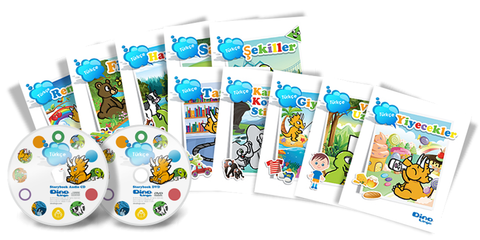 Dino Lingo Turkish for Kids learning program teaches the most common 200 Turkish words and phrases in 6 DVDs. Dino Lingo Turkish learning flashcards teach the most common 150 words in Turkish. There are 150 total flashcards included in your bundle. Turkish Flashcard Set Categories: Numbers, Colors, Food, Fruit and Vegetables, House Items, Body Parts, Family, Clothes, Vehicles, Nature, Animals, and Greetings. Dino Lingo Turkish Posters teach the most common 150 words on 10 posters. All the words are written in Turkish. Each poster is printed on glossy card stock paper. Posters are foldable and very easy to use.Turkish Poster Set Categories: Numbers, Colors, Food, Fruit and Vegetables, House Items, Body Parts, Clothes, Vehicles, Nature, and Animals. 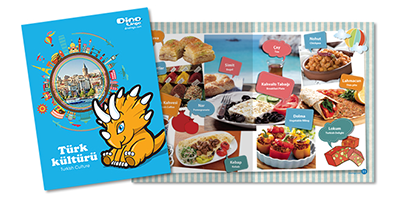 Dino Lingo Turkish Vocabulary Book is considered as a guidebook for the DVDs. It is designed in a way that parent can follow each lesson through the book. The book has colorful animations and subtitles. All the pages are printed on glossy paper. Turkish Vocabulary Book Categories: Numbers, Colors, Food, Fruit and Vegetables, House Items, Body Parts, Family, Clothes, Vehicles, Nature, Animals, and Greetings. 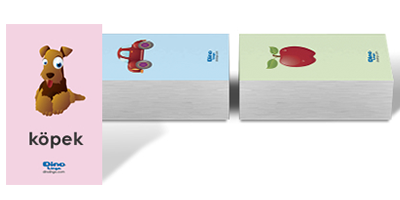 The Turkish Storybooks can be used as a supplement to the vocabulary learned through the DVDs and flashcards. By engaging in these simple and easy to follow stories, your child will have the opportunity to listen and say much of their new vocabulary used in context. The Storybook Sets also includes an Audio CD and DVD accompaniment to help immerse your child in Terry and Rexy’s fun adventures. Each story is read by a native speaker and provides a whimsical musical environment where your child’s imagination can soar! The Storybook DVDs provide a visual and audio representation of each story, so that you and your child may follow along as the native speaker guides you through each tale. Turkish Storybooks include: Numbers, Colors, Food, Fruit and Vegetables, House Items, Body Parts, Shapes, Clothes, Vehicles, Nature, Animals, and Greetings. This album includes 10 Turkish children’s songs, which may be used as a fun way to introduce and familiarize your child with traditional Turkish sounds and rhythms. Listen to this fun and upbeat compilation together, in the car, at home, or where ever the fun may take you! The Turkish Alphabet Book offers a great learning solution to teaching the letters which make up the Turkish language. It’s a perfect guide for children learning to pronounce and write the alphabet of a new language. The Turkish Alphabet Poster is a fun guide for the letters which make up the Turkish language. 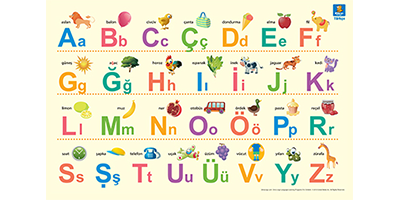 It’s a convenient visual for kids learning to pronounce and write the Turkish alphabet. The global community is a diverse and complex place. As a result of the meteoric rise of globalization, the children of today are much more likely to interact with people who come from different cultural backgrounds. Turkish Culture for Kids is designed not only to teach children fun and interesting facts about the lifestyle of Hungary, but also to foster a deeper understanding and cultural connection with Turkish speakers. The Animal Picture Dictionary presents kid’s favorite animals in a playful new perspective. A quick glance at the index is all it takes to connect images of both exotic and common critters with their Turkish names. Try having your little one show you which animals live in your home country, or having them tell you what colors the animals are in Turkish, and it is great for playing games! 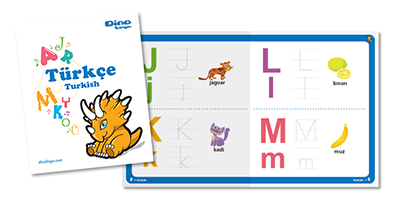 The Dino Lingo Progress Chart helps to monitor your child’s progress each week. This chart includes 200 small stickers and a weekly progress report you can use to track their achievements. All images from the DVDs and flashcards are included in the chart to help spark your child’s memory as they point to each image and name the Turkish vocabulary word. Dino Lingo’s coloring book was created with the vocabulary book and poster set in mind. While coloring the illustrations from the book and the posters, kids will naturally remember and repeat the words in Turkish. These furry little guys are the perfect size for little fingers! During the Turkish immersion process, your child’s fuzzy finger buddies can be used for a wide variety of instructional and role-play exercises. Studies show that role-playing with puppets can increase vocabulary retention far more than simply hearing or reading a word. Learning Turkish has never been this fun!